In general I like to work with painters – there’s a poetry in painting that gives endless possibilities and painting is often about looking inward – searching the “space within”. Silent Painting is the sixth show I have curated, featuring three women artists at an exciting new space in King’s Cross, the Tripp Gallery. The idea for the exhibition came when I stumbled across a painting I had not seen since I was a student. I was wandering around the National Gallery when I spotted Rembrandt’s Self Portrait, 1669, made at the end of his life when he was 63 years old. It’s quite a sad painting – the darkness of the work reflects the old man’s mood as he contemplates his own demise and it seems he has nothing left to say. 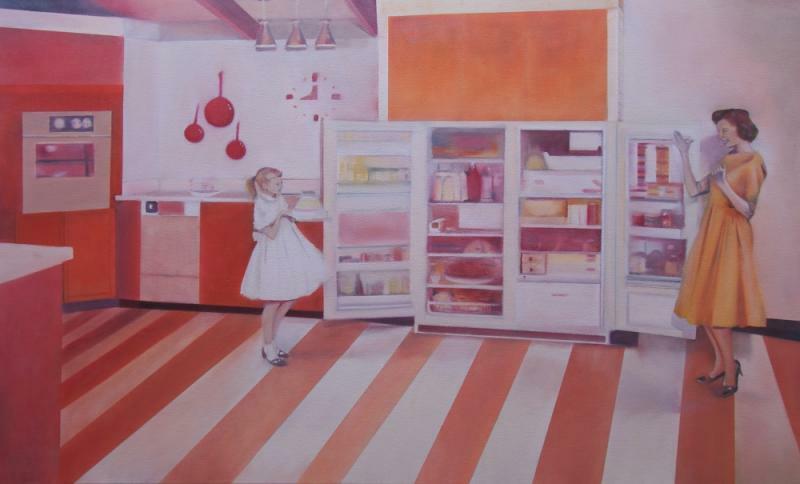 The painting I have selected for this show from my own work is The Perfect 50s Housewife, 2018 (main picture). It tells the story of the American housewife from a bygone era, who has bought a new fridge and stuffed it with food and drink. Her daughter stands there showing off her huge homemade cake whilst the mother mimes “Isn’t it big!”. The fashionable scenes displayed in my work are populated but focus on the non-communication or separation of each figure from the other, creating a void of silence.